In the scouting world, measurements are constantly used to compare and contrast prospects. Height, weight, wingspan and athletic ability are some of those measurements, and colleges are always looking for the bigger and stronger player. However, those measurable mean very little when a player without heart or toughness meets on the court with a player who does have that fiery, competitive demeanor. At 5’10 and 165 pounds, Cincinnati Woodward 2015 point guard Isaiah Jones doesn’t have the most intimidating frame in the state, but he more than makes up for that with his desire to win. Dating back to his junior high days, Jones built a reputation in Southwest Ohio as one of the top on-ball perimeter defenders in the area. Not only does Jones have the quickness to harass opposing ball-handlers, but his commitment to slowing down the other team’s top player gives him a mental edge to take his game to the next level. During his junior campaign, however, Jones has also established himself as an offensive force, putting up 20.5 points per game for the season. After being criticized early in his career for a lack of consistency with his outside jumper, Jones has now become one of the more capable shooters in the Cincinnati City League, knocking down 73 three-balls on the year at a more than respectable 38% shooting. In Triple Double Prospects first viewing of Jones in a Woodward uniform this season, a close loss at Covington Holmes (KY) last month, the junior poured in 28 points, including connecting on five trifectas. The junior point guard also averaged 3 assists, 4 rebounds and 2 steals a game, balancing the stat line for the Bulldogs as they have begun to climb out of the cellar of the league and become relevant once again. Under coach Paul McMillan, who happens to be Jones’ stepfather, the Bulldogs were able to win 12 games in 2013-2014, more than double the win total from their previous campaign. A large part of that increased win total came from the presence of Jones, who was only able to play seven games the previous year as a sophomore due to OHSAA transfer rules when he left Northwest HS to enroll at Woodward. The ability to lead his team to wins has also helped Jones accumulate interest from several regional Division I colleges. According to McMillan, Eastern Kentucky, Morehead State, St. Francis (PA), St. Bonaventure, Toledo, Ball State and Miami (OH) have all reached out to either the family or one of Jones’ coaches from his AAU team, Ohio Basketball Club. Additionally, Maryland and West Virginia have also been involved, as Jones tries to prove that he is capable of playing at the highest level of college basketball. 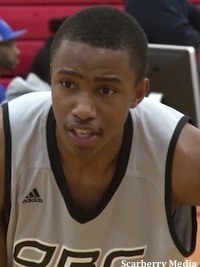 As one of Triple Double Prospects top ranked point guards in an Ohio class of 2015 that we’re really excited about, expect to follow the progress of Jones on this site as the AAU season and his senior year unfold.